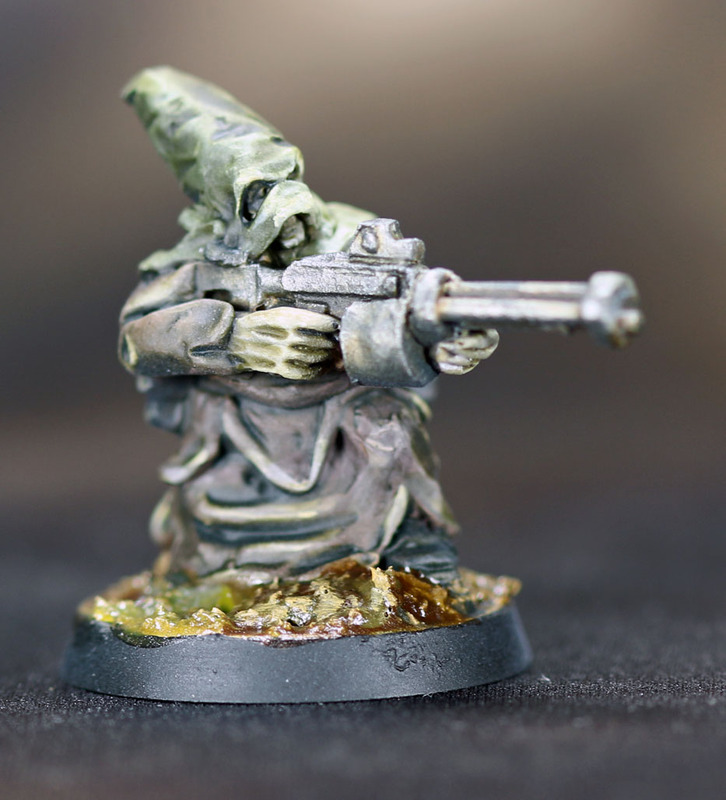 So I wasn't sure I would be able to get the Cult models done before the Sandstorm Wars Kickstarter was over. But I did it! 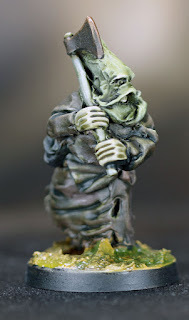 And there is one major reason for that...these models are some of the easiest to paint that I've ever worked with! I primed these models with Vallejo Leather Brown Primer from my airbrush. I've not used that before (it came with a set I bought), but it was a great base for these guys since I knew I wanted to paint the in a lot of muted, earth hues. 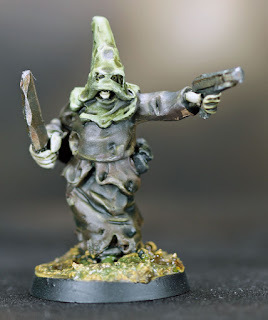 For the hoods, I airbrushed on Citadel Castellan Green and then I mixed in some Citadel Nurgling Green, and then pure Citadel Nurgling Green, each applied from a higher angle. Then I applied a mix of Citadel Nurgling Green and Kreig Khaki around the eye holes and mouth followed by another edge highlight of just Kreig Khaki. 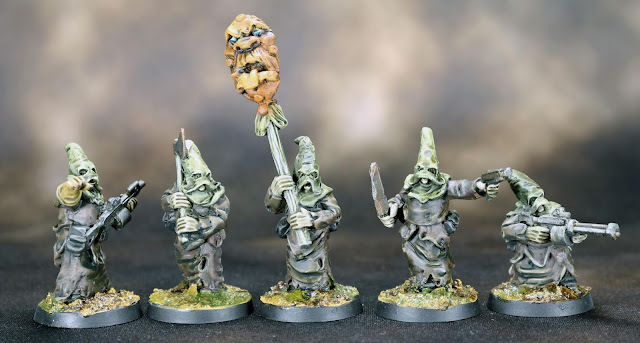 The brown robes were based in Citadel Dryad Bark and progressively highlighted with Citadel Gorthor Brown, Baneblade Brown, and P3 Menoth White Base. The black leather was based with a mix of black and Citadel Skavenblight Dinge and highlighted by mixing in Citadel Baneblade Brown. The flesh was pretty simple as well, it's just Citadel Rakarth Flesh highlighted by mixing in Citadel Pallid Wych Flesh and the wood was Citadel Dawnstone highlighted by mixing in P3 Menoth White Highlight. At this point, the entire model was washed with Citadel Athonian Camoshade. I left the wash to dry overnight, and the next morning I painted the metal bits with a base of black mixed with Scale 75 Black Metal, drybrushed with pure Black Metal and then Scale 75 thrash metal. Then they were washed with Citadel Seraphim Sepia. 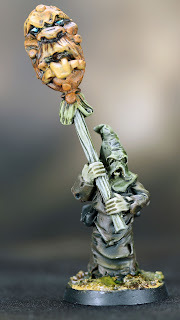 The axe and knife also got a wash with Citadel Fuegan Orange. One thing I omitted in the previous post was a scale shot, so I made sure to take one here. As you can see, the Chosen are about the same height as the modern Plague Marines, minus the size of the helmets. And the Cult aren't much smaller than the Chosen! Although the cult, themselves are barely taller than a plastic Cadian. 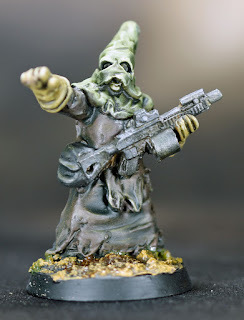 Overall, I really liked these cult models, they fit a good niche that Games Workshop have missed out on. They are a classic, masked cultist without all the crazy of the plastic Games Workshop cultists and Poxwalkers. I'm definitely picking up a few more of them, so if you like these, visit their kickstarter before it's over. 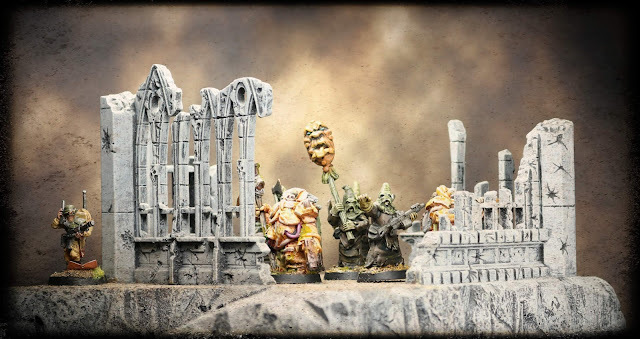 Those are cool (and well painted)!